The MJHL Digital Sign Network is an exciting new LED advertising product in all 11 Manitoba Junior Hockey League (MJHL) arenas. All 11 digital signs are 18’ wide x 3.31’ high and are placed in highly visible locations in each arena space. The MJHL Digital Sign Network is a cost-effective way to reach a Manitoba-wide audience with time-sensitive messaging as you are able to change the ads frequently. Each full video, full animation, digital ad runs for 10 seconds and rotates frequently. Reaching a broad rural Manitoba audience is a challenge for advertisers. 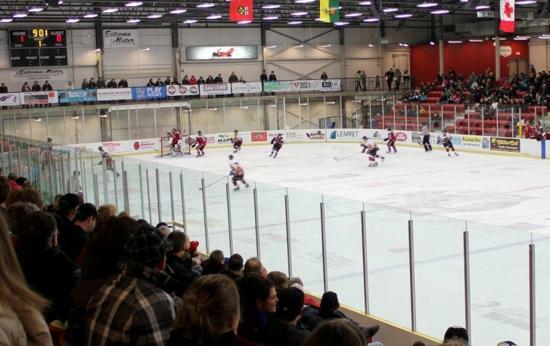 The MJHL Digital Sign Network has the potential to reach 2.4 million arena visitors/users annually. Ad agencies/media buyers have given the MJHL Digital Sign Network a ‘thumbs-up’ for rural Manitoba reach. Advertising revenue from the digital signs is distributed among all MJHL teams to support local hockey programs as well as building the MJHL Scholarship Fund. To advertise locally (1 arena), contact your MJHL team.